We all know that the fiber community is ...well…a tight-knit group. There is something about seeing another person knitting or crocheting, that we feel the need to introduce ourselves as a fellow fiber enthusiast and tell them what we are working on, even if we don't speak the same language. Fiber is the great common denominator that becomes a universal language. So when there is a loss in the fiber world, it is one that we all feel personally. I am sure you have by now heard about the loss of our fiber friend, Kathreen Ricketson. She and her husband recently passed away, leaving behind two small children. Our good friends, Kay and Ann at Mason Dixon Knitting have released a pattern called A Light in the Window. The pattern is free for a limited time (from now until June 3, 2013) and Ann and Kay ask that you consider making a donation to the Education Fund for Otijillo and Orlando Shugg(Kathreen’s children). Originally designed as a knit-along for Ann’s book Bowling Avenue, the blanket is made from Liberty Wool and Chesapeake using mitered squares and garter stitch trim. This is one of those pieces that will become an instant classic. With lots of colors to choose from, your options are limitless. How many times have you looked at a picture on a knitting pattern and thought "I wonder what the back looks like?" only to find yourself disappointed? 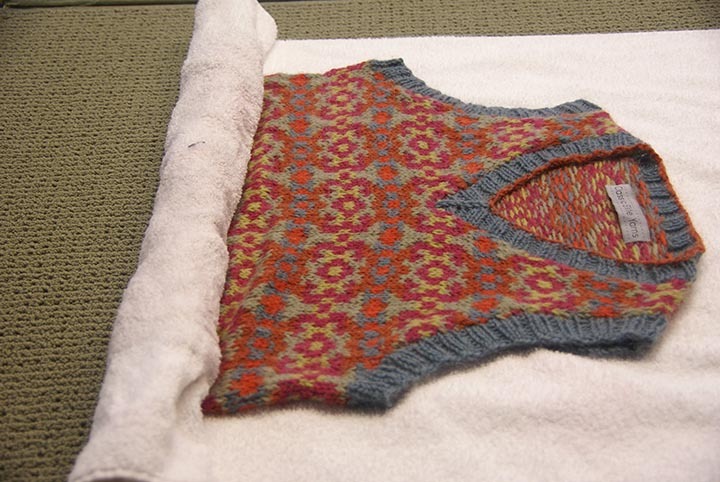 This is NOT the case with the Nova Cardigan by Sarah Fama in the Summer 2013 Interweave Knits. The focal point on this cardigan is the back. The triangles meeting in the center back give the cardigan an optical illusion that is flattering to most shapes. And I love the way Sarah incorporated the waist shaping into the eyelet detail - very clever! The i-cord detail on the seed stitch collar gives the cardigan a polished feeling - perfect for the office yet casual enough that it would be really cute over a sundress or with a pair of jeans. The Nova Cardigan is made from Firefly, one of our favorite summer yarns. Made from linen and rayon, Firefly is a great choice for warm weather knits. It makes great layering pieces and has just the right amount of sheen with a slight thin/thick texture. This is one of those yarns that gets better and better the more you wash it! The hardest part thing about this cardigan? Picking a color. Photos courtesy of Interweave Knits. Photographer Joe Hancock. 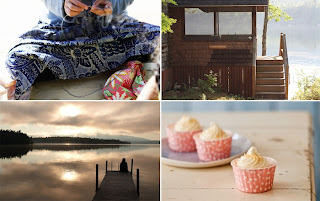 There are three little words that so many crafters love to hear—Squam Art Workshops. 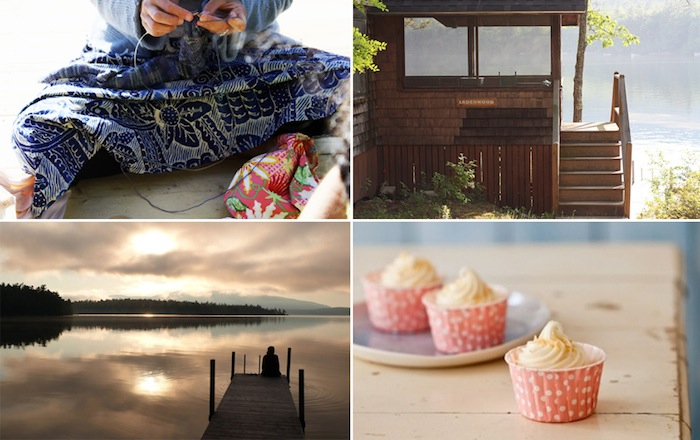 Known simply as Squam to many of us, it is a retreat for adults featuring classes in many creative endeavors including knitting, crochet, embroidery, drawing, woodworking, sewing, creative writing, photography, jewelry making and more. And it all takes place in beautiful Holderness, NH on Squam Lake. This year Ravelry is hosting a party - the Ravelry Reverly - and it sounds like it is going to be a lot of fun! Classic Elite Yarns is very excited (and proud) to be a sponsor of this year's event. Each sponsor will have an activity booth on Saturday June 8 from 1-5 PM. For our activity booth, we decided that we wanted to do something fun, and good for our community at the same time. We will be teaming up with Warm Up America to make blankets for those in need. 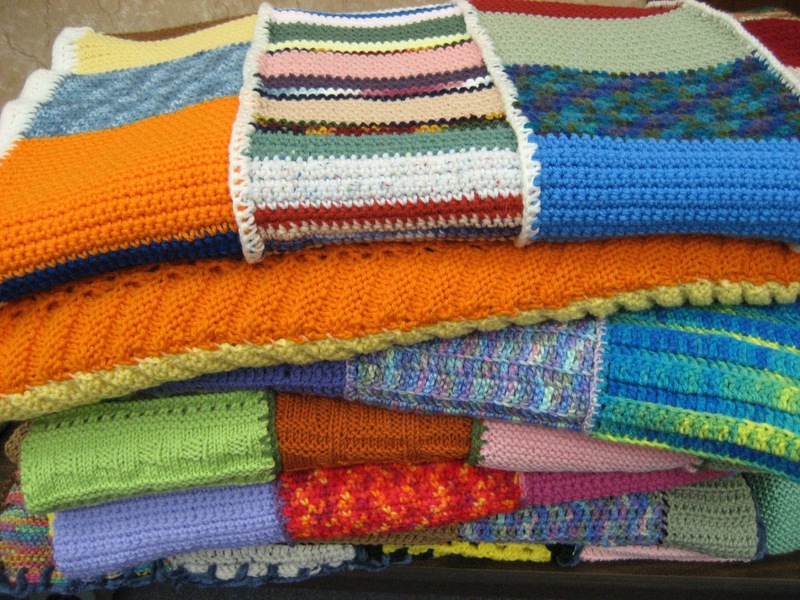 We'll have squares on hand for people to join together to make blankets, as well as yarn and needles/hooks for people to make additional squares in our booth. We'll also be hosting races to see who can knit* a 7” by 9” square the fastest. There will be several ‘heats’ starting every half hour on the half hour. A basic pattern and some CEY yarn will be provided for you to use; we'll also have some needles and hooks available, but if you'd like to bring your own, please bring size 6 or 7 needles or size G-H hooks. The person with the fastest time at the end of the day will win a certificate that entitles them to a copy of our entire fall 2013 pattern collection! If you are unable to attend Squam, but still want to participate…you can! 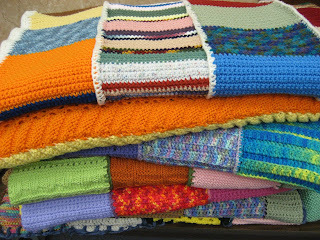 You can make a 7” by 9” square and mail it to us and we will happily join them into one of our Warm Up America blankets. Please mail them to us by June 5 (address below), and be sure to include your contact information. And the fun doesn't end there! 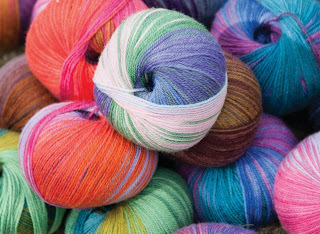 Each year, Squam Art Workshops ends the retreat with an Art Fair, on Saturday evening from 7:30 - 10 PM, focusing on fiber arts. We'll be having a table at the fair with lots of CEY goodies, including some that are unique to the Fair (I REALLY wish I could give you a sneak peak, but I am sworn to secrecy). The Fair is open to the public, so if you live in the Holderness area and aren't attending the workshops, you can still come down and check out all the fibery goodness. *Please note that while we encourage crocheted squares as well as knitted for the overall project, the contest is for knitted squares only. Lots and lots of crayons! One of my first thoughts when I find out someone I know is pregnant is "what I am going to knit for her?" This is true for close friends and family, as well as people I hardly know…like my dental hygienist. I know it's partly because I love to knit, but also because I love babies. And I feel strongly that every baby should have at least one hand knit item to welcome them into the world. It's possible that the baby won’t have anyone in the family who knits (shocking, I know), and I am happy to step up to the plate and work my needles for any little bundle of joy. When Classic Elite Yarns found out that our good friend Katarina, Director of MillaMia, was going to have a baby, we decided to make a group blanket. I have long been a fan of 64 Crayons by Amy Swenson. Designed specifically for yarns that have long color repeats, I knew Liberty Wool Print would be the perfect choice. Not only did it have the necessary color repeats, but an added bonus is that it's machine washable, perfect for all the little incidents that babies are known for having. Since this was a baby blanket, we adjusted the pattern to make it a little shorter and with fewer stripes in it to make it a little smaller. We also decided to use garter stitch, which was a great choice because we could work on it during meetings and lunch. We grabbed a few skeins and set to work. Each of us was responsible for knitting a stripe and then we put them together to create the blanket. 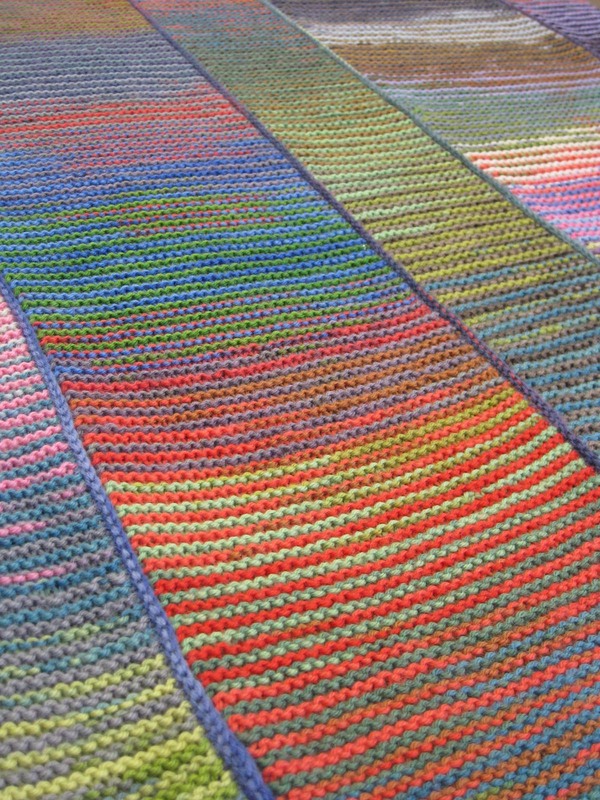 It didn’t take long for us to finish the blanket, and we all love the way it turned out. The colors all work really well together, and because we didn't choose traditional soft baby colors, her son will be able to use this blanket for quite a while. We got an email from Katarina last week that she had received the blanket and loves it! She told us that she will send some pictures of her son with the new blanket shortly. And I plan on holding her to that! 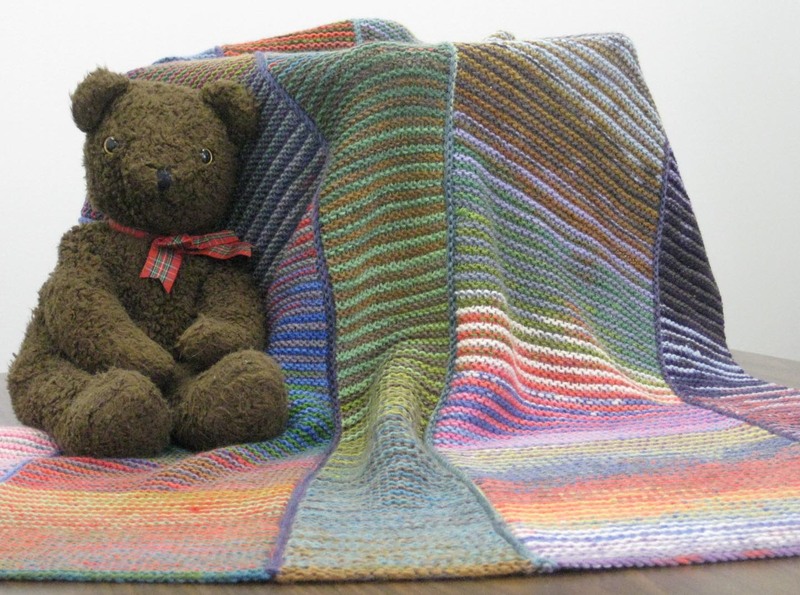 Have you used Liberty Wool or Liberty Wool Light for any baby projects? We would love to see them! Send your pictures to blog@classiceliteyarns.com along with the pattern information and Ravelry link (if possible), so we can share with everyone. Spring is finally here in New England. And I for one couldn't be happier! But it does present one time-consuming chore no one likes to do - but we must. Before I put away my sweaters and take out the tanks, I need to wash them. This is good for the health of any sweater. So much time goes into knitting a sweater; I want to make sure that I care for them so they can last as long as possible. Washing sweaters before putting them away will help deter any little critters from getting into them over the summer months. 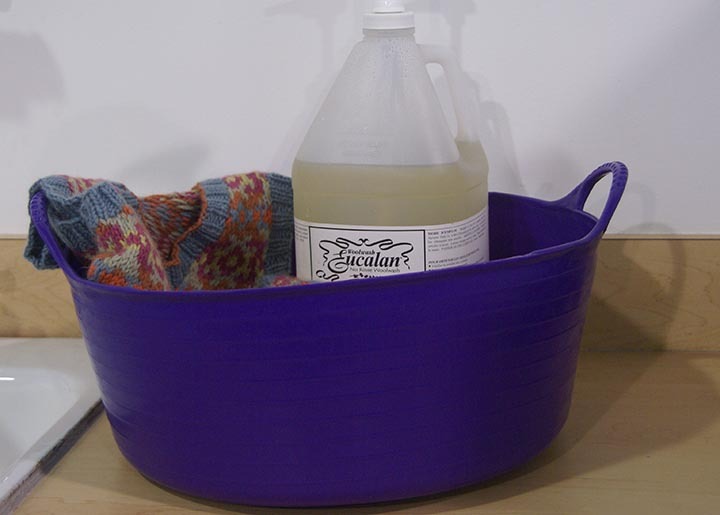 I like to wash each sweater individually by hand, using a product like Eucalan or Soak, which are no-rinse products. I have a special bucket that I like to use. It is an oversized plastic tub that I got at a discount store and I use only for washing my hand knits. That way I am sure no chemicals accidentally get into my knits. I begin by filling the tub with lukewarm water and some of the washing agent (read the label for specific amounts). I then gently submerge the garment in the tub and let it sit for 20 minutes or so. I check on it every few minutes and give it a gentle massage. 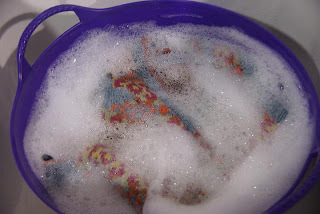 I then remove the garment from the tub and very gently squeeze it to release as much water as possible. Next I will roll the garment in some clean dry towels, to remove even more water from it. Then I lay the garment flat to dry and pin it (if necessary) to the measurements I want it to be, to ensure that it dries to that shape and size. Don't leave the garment to dry in the sunlight, otherwise the front of your garment will be a different color than the back (I speak from experience on this one - please don’t make the same mistakes I have). The last step is to wait for the garment to dry fully. You want to make sure it's completely dry before you tuck it way. There are several factors that will determine how long it takes to dry – how big the sweater is, the humidity on the day you wash it, your altitude, etc. You can also put a fan on it make it dry a little more quickly. I store all of my out-of-season clothes in a cedar chest, which is a natural moth repellent. But I also throw in a few lavender pouches (another natural moth repellent with an added bonus of smelling nice). I know quite a few people who use rubber bins to store their sweaters and some who even go as far as taping down the lid. The important thing is for you to find something that works for you. Somehow, despite my best efforts, I am usually late with my Mother’s Day gifts. 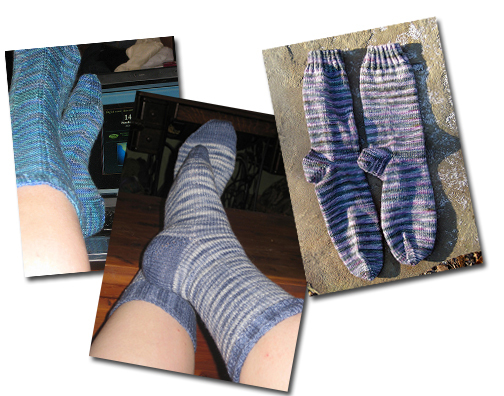 Often it is because my mother loves hand knit socks and while I can make a pair of plain socks in a few days if I put my mind to it, I am easily distracted when it comes to knitting (my internal dialog goes something like this - ohhh…I like that cardigan, I need to cast on. But wait, what about that cute top you have been looking at for months? Now is a good time to start working on that. Socks, you need to work on those socks. But I really do need a new afghan. This probably sounds familiar to many of you). I mayhave given her a sock with the needles still in it one year for Christmas and as soon as she opened the box, I asked for the sock back so I could finish it (full disclosure, it was only the second sock that wasn't done. And I was staying with her the days leading up to the holiday, so I felt I couldn't work on them in front of her). But this year if different! Not only was I on time for Mom’s Day…my mother has already received her gift! A few weeks ago I was on the phone with my mother. She said she wanted a new knitting project. My mom is the knitter who will make a scarf and then put down her needles for months on end (this is so not the type of knitter I am. I can't go a day without knitting.) She also likes small quick projects. I began asking her what it is she wanted to knit. Me: How about a hat? Me: How about a bag? Mom: No…not really my style. I could see this was going to be a challenge. The next day at the lunch table I was telling one of my co-workers about my quandary. I wanted to help find my mom something to knit. But she had shot down all of my immediate ideas. We came up with the idea of her making dishcloths My mother is no stranger to making dishcloths In fact when she taught me to knit when I was a kid, she taught me to make the garter stitch dishcloth that is a square, knit on the diagonal starting with 3 stitches. This is still her go-to pattern. She has made it so many times, she has it memorized (it’s a really easy pattern…you can find several versions on Ravelry). I decided to give her some Seedling for making the dish clothes. I chose 3 different colors that I knew would go with her kitchen and pulled 2 skeins of each of the colors. My colleague suggested that I find some free dishcloth patterns on Ravelry and print them out. I downloaded a bunch of patterns and put them in a folder for her. I found a cute little knitting bag to put everything in, so she could keep it all nice and tidy. The other day I received a phone call from my mom. She had received her package in the mail and was so excited. It was a win-win for her. Not only did she get her Mother’s Day gift early…she now had something to knit. She said she really liked the idea of getting a project to do. She loved the yarn that I picked for her, only said she was afraid it might be too nice for her kitchen - and I have to say that I agree with her. So instead she is going to use the yarn to make wash cloths for her bathroom. Luckily she used the same colors in her bathroom as she did in the kitchen. I can't wait to see her FOs.I told her she had to take some pictures and I will share them with you when she does. This year Mother's day in the United States is on May 12th. Are you giving your mom (or grandmother, aunt or other mother type figures) yarn for Mother’s Day? How about knitting her (or him) something special to show you care? Time is running low, but if you set your mind to it (and don't get distracted like I do), you can do it! I have long admired the patterns for MillaMia, but don’t have many children to knit for. So when they introduced their current lines of patterns I was really happy. I recently had a chance to ask Katarina, the Director of MillaMia a little about knitting and MillaMia’s vision. CEY: How long have you been knitting? Katarina: I have been knitting since I was 6 years old. 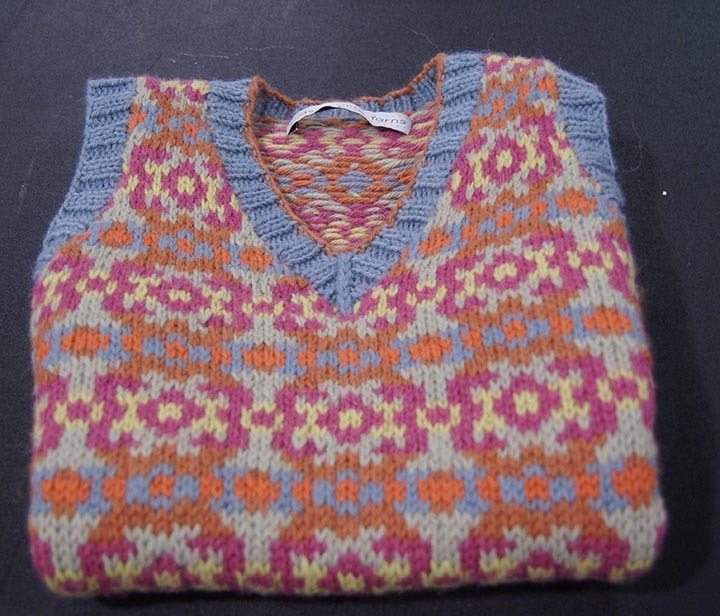 My grandmother taught me to knit when we used to spend our summers at our countryhouse in Sweden – on a rainy day there was not a lot to do as it was quite remote, and knitting became a favorite pastime. 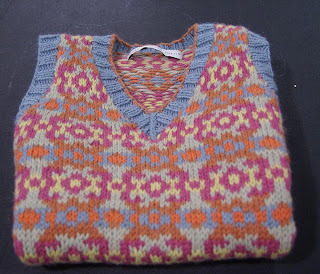 I then had a long break from knitting, coming back to it again when I first became a mother 7 years ago. CEY: What is your favorite type of project to knit? KR: With three young children (2 months, 4 and 6 years old) I obviously love to knit kids’ stuff. I love how you can be really bold and adventurous in your color choices, and above all I love how ‘do-able’ these projects are due to their smaller size. The feeling of achievement when you finish a piece of knitting is a real buzz and keeps me hooked on the craft! CEY: Who is your biggest knitting inspiration? KR: My grandmother was obviously an important early influence, but at this moment I would have to say Max – a friend who is now a colleague and has been helping us with MillaMia for the past year (managing our MillaMia blog amongst other things). Max is so passionate about knitting that it is really infectious – and her skills (she is by far the best knitter I know from a technical perspective) and willingness to help others makes all of us in her environment braver about the knitting we chose to try. CEY: What made you want to start a yarn company? CEY: In the past, you have focused on children’s patterns. In your new books Country Escape, Colour Coded and the upcoming High Society you have adapted many of your patterns for adults. Can you tell us about that? KR: As you say as a company we are pretty much known for our children’s patterns. However a constant request that we would get by email and face to face at both trade and retail shows was for us to also create our designs for adults. The number of times we had people look at one of our samples and say ‘ I would wear that’ meant that in the end we felt we really had to listen to this feedback. In creating our adult collections we have taken this customer feedback at face value – adapting some of our most popular children’s designs directly to adult sizing and shaping, other designs are an evolution from our children’s styles and still more are completely fresh and new. It felt like a risk but the response has been phenomenal – it really has opened MillaMia up to a new audience of knitters which feels great. CEY: Do you have plans for any more children’s patterns? KR: Of course! We love designing for children and with my 7 week old son now available to join the MillaMia modeling stable expect some more stuff for babies too! CEY: Any other plans for MillaMia that you are willing to share with our readers? KR: We are thrilled to be launching some new Naturally Soft Merino yarn colors – 3 new colors in our core collection and 2 exciting shades as seasonal colors. This will be in the Fall. And of course we need to make sure we have fantastic pattern support for these new colors too. CEY: I know you are a new mom; do you still have time to knit? KR: I have to be honest and say juggling 2 school kids, a new baby and a business is a challenge – there were never enough hours in the day even before Johan (my new son) came along, and now with the demands of nursing and sleepless nights there seem to be even fewer! However – even if it is just a few rows that I manage – there is nothing as relaxing as knitting, so it tends to be my treat when all three are finally asleep at the same time. You can see all of MillaMia’s designs and the colors of their Naturally Soft Merino on our website.